Leah is a science geek who writes mostly about health and biology. 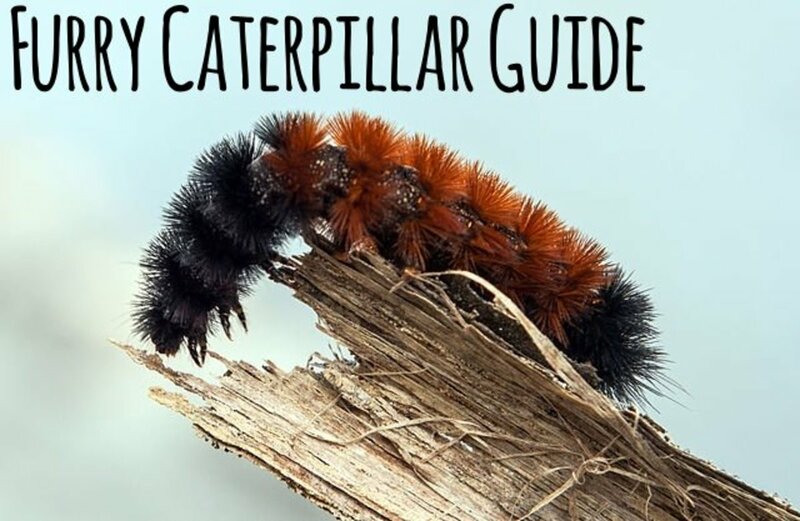 She also enjoys writing about pop culture, cooking, and DIY projects. An average sized person contains around 4.7 to 5.5 liters of blood in their body, which makes up about 7% of their body weight. Blood flows throughout the entire body, from head to toe, on its own superhighway- the vascular system. As it travels, it acts as a vehicle, dropping off and picking up oxygen, carbon dioxide, and waste to name a few. 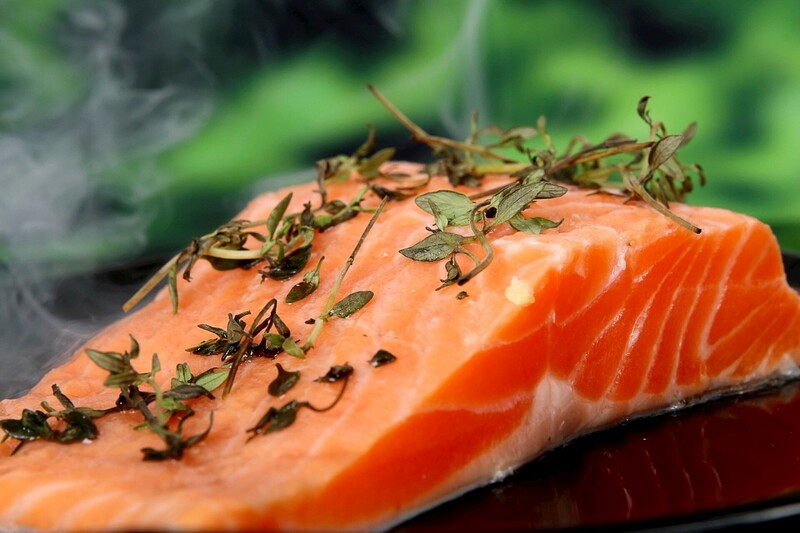 Blood also plays a critical role in immunity and homeostasis. Most people have a general idea of the components and functions of blood. Blood is made up of formed elements and plasma. 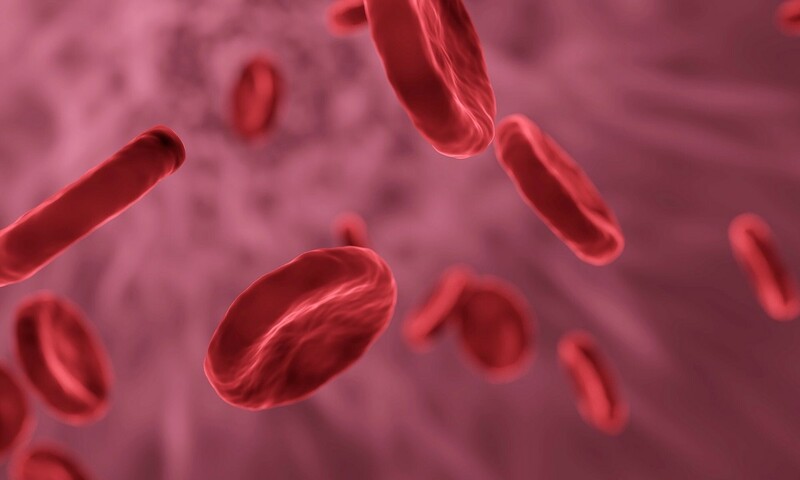 The formed elements are red blood cells, white blood cells, and platelets. 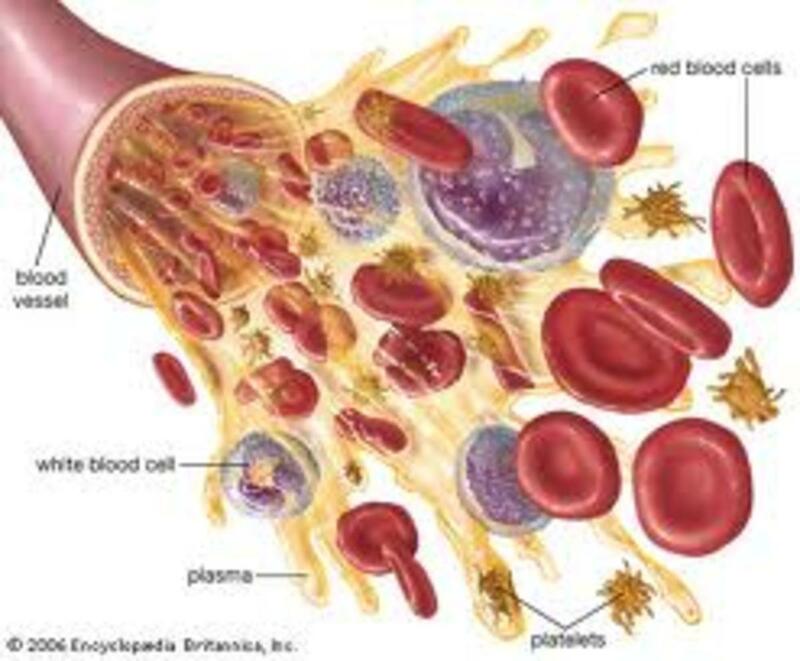 Erythrocytes, or Red Blood Cells (RBCs), function in gas transport- dropping off oxygen to the bodies’ tissues and picking up carbon dioxide from the tissues to dispose of. There is only one type of red blood cell, but there are five types of white blood cells all which play various roles in the immune system. Platelets serve a protective role in blood coagulation, or clotting, which prevents the body from losing too much blood in the case of injury. Plasma makes up about half of blood. 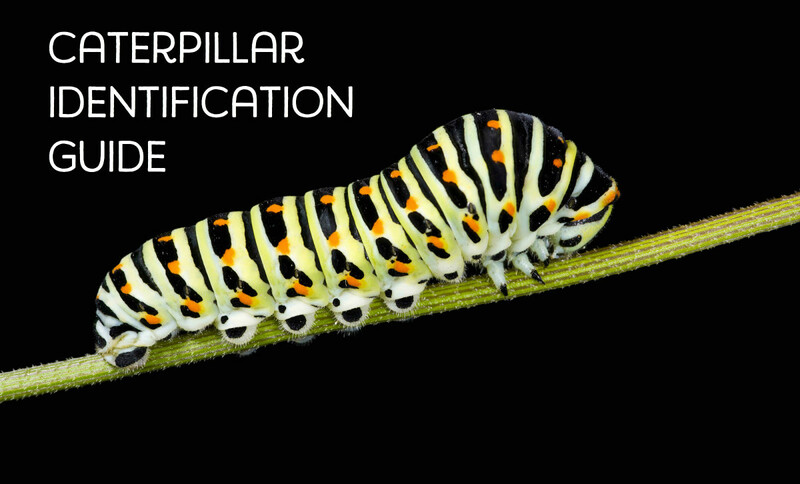 It contains various dissolved ions and proteins and acts as a carrier for a variety of hormones, nutrients, and waste products. 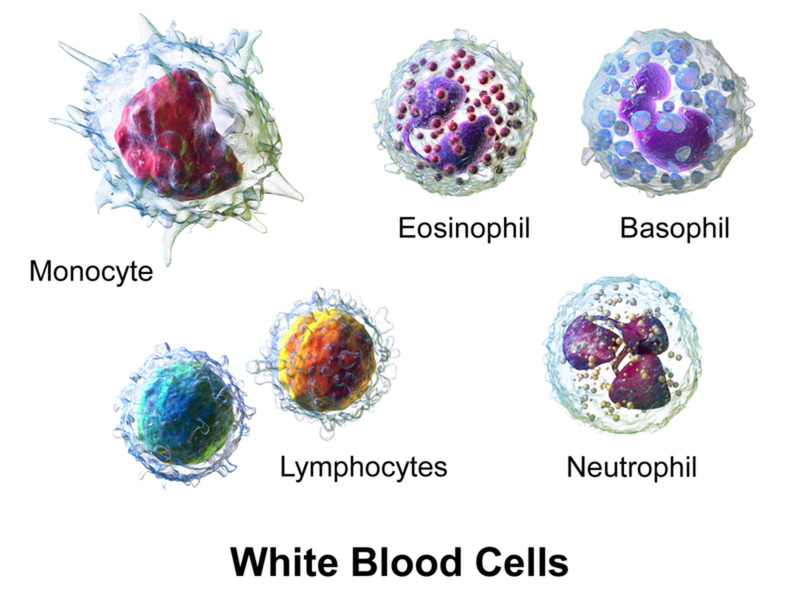 Five types of white blood cells. Source: BruceBlaus, wikimedia commons, CC BY 3.0. Leukocytes or White Blood Cells (WBC) are subdivided into those with granules and those without. Granulocytes-Neutrophils, Eosinophils, and Basophils- are further named for how they stain in the laboratory setting. The agranulocytes, those WBCs that do not contain granules, are lymphocytes and monocytes. Each of the five white blood cells plays a different, although sometimes overlapping, role in immunity. Some function by engulfing harmful intruders via phagocytosis, others tag intruders with antibodies targeting them for destruction. 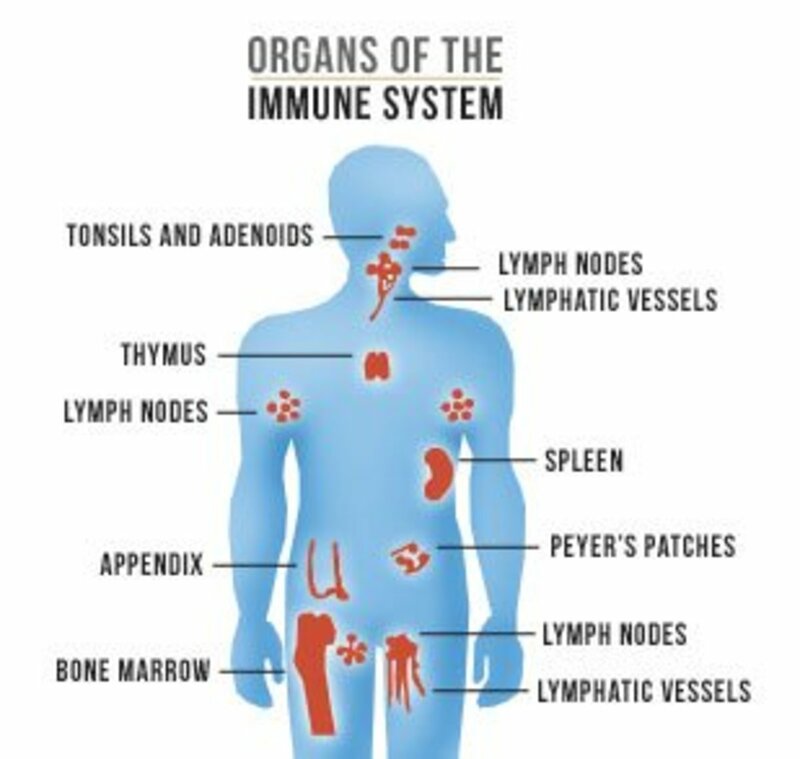 Lymphocytes can be further subdivided into T and B lymphocytes depending on where they are made and what they function in, and Natural Killer Cell (NK cells). B and T lymphocytes both recognize antigens on intruders' surfaces and react in a way that aids the immune system. How they react distinguishes them- B lymphocytes make antibodies while T lymphocytes produce cytokines or toxic granules to get the job done, depending on if they are T helper or cytotoxic T cells, respectively. Natural Killer cells recognize a cell surface protein on particular intruders and release toxic granules to defend the body against these bad guys. When called into action, monocytes will further differentiate into macrophages or dendrite cells. These will function by either recognizing and responding to antigens, phagocytic functioning to engulf the intruder, or by releasing cytokines to illicit an immune response. This typing system also indirectly tells which antibodies are present in a person’s plasma. 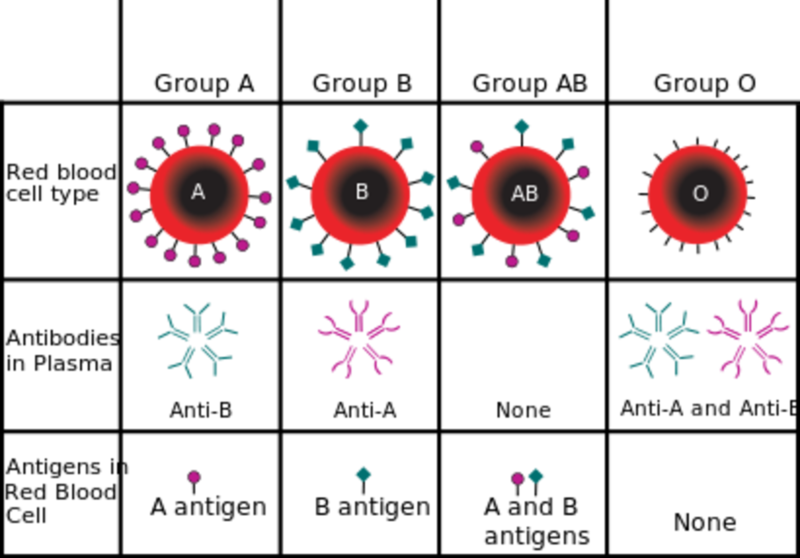 In the case of the A blood type, the individual will have B antibodies ready to mount an attack if blood containing the B antigen is presented and vice versa. People with O type blood have no antigens on their erythrocytes and thus these people are known as the universal donor since no blood type will attack their blood. Type AB has both antigens on its RBCs surface, which means if it had both A and B antibodies it would constantly be attacking itself, so type AB has neither antibody making it the universal acceptor. People with this blood type can receive any blood type and their body will not attack it. Blood typing. Source: Shahinsahar, Wikimedia Commons, CC BY-SA 3.0. Source: Phoenix_B_1of3, Wikimedia Commons, Public Domain. There is one more component of blood typing, if you know your blood type you are aware there is a 'positive' or 'negative' tacked onto the lettering of your type- A+ or O- for example. This further denotation in blood typing refers to the Rh factor’s presence (+) or absence (-). 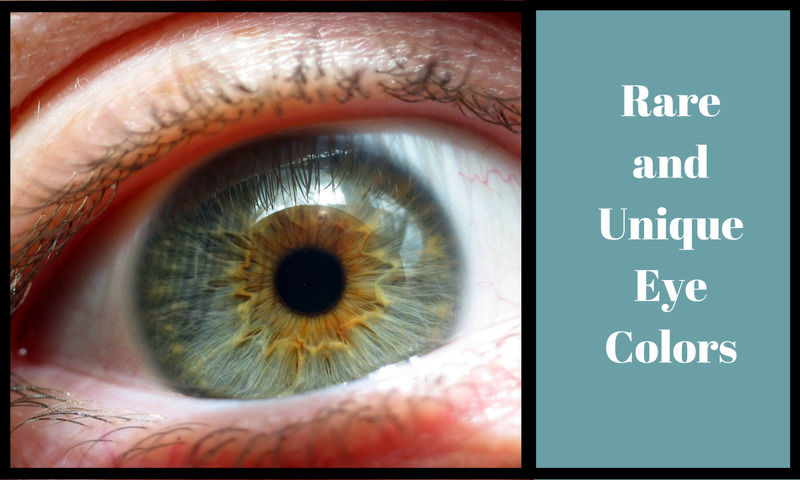 Rh is another type of antigen, also found on the surface of red blood cells if present for an individual. There are more than 50 Rh antigens, 5 of which are found to be critical in these types of blood reactions, where the Rh D antigen is the one referenced in a person's blood classification. 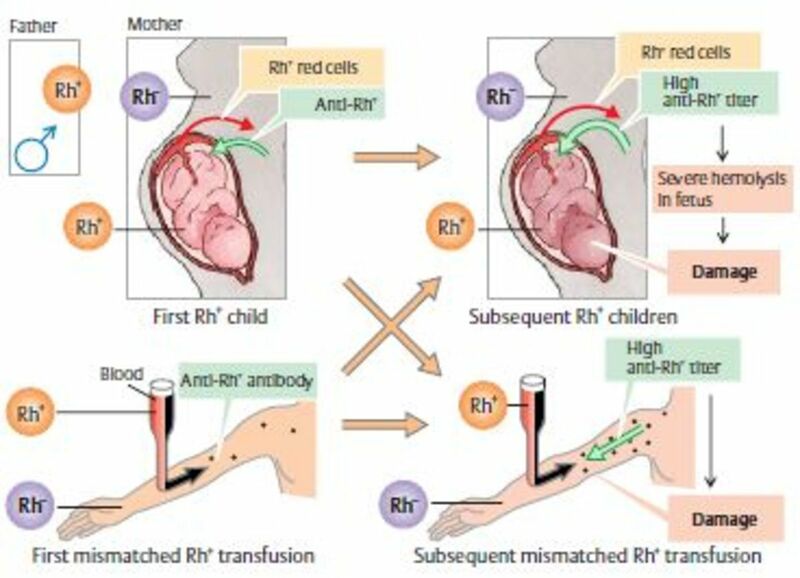 If a person does not have the Rh antigen on their RBCs, they don’t automatically have the Rh antibodies present in their blood but if exposed to Rh positive blood they will produce them. In this case an additional exposure to Rh positive blood will result in a hemolytic reaction. 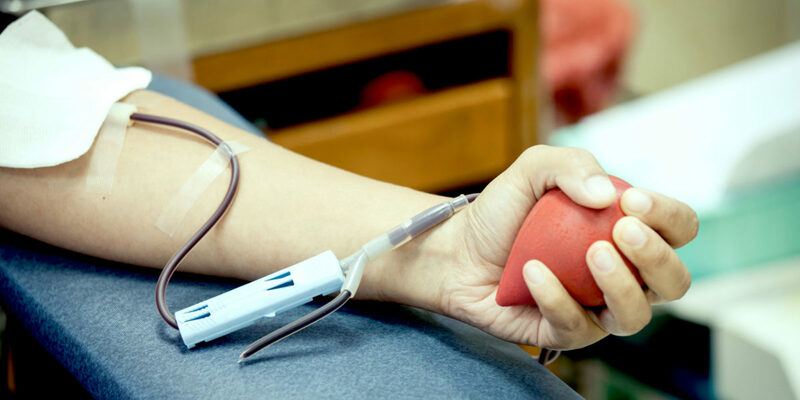 This is of particular importance to patients receiving transfusions and, as it is more commonly associated, with women who have multiple pregnancies. 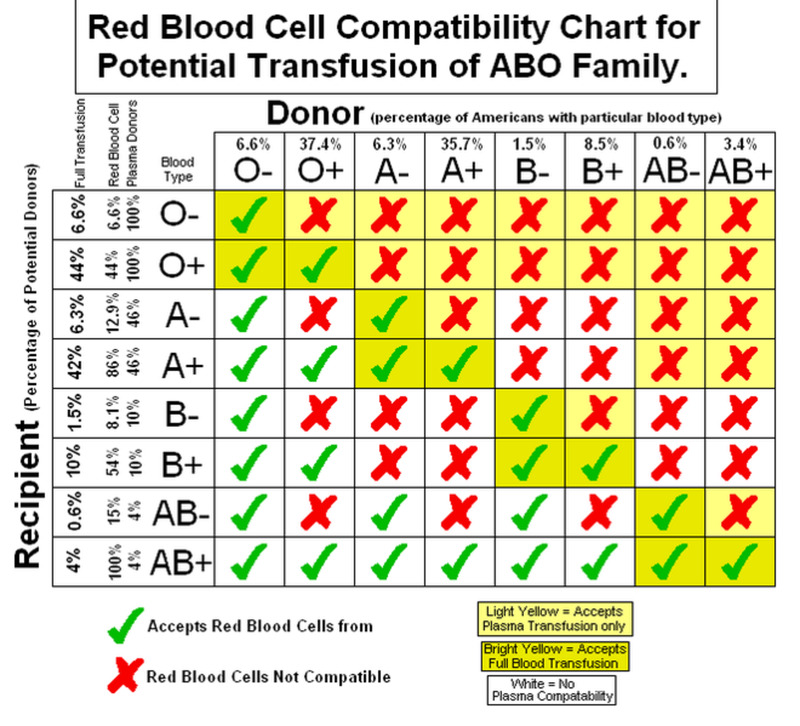 For transfusions the Rh status of the donor and recipient is matched. In the case of a Rh negative woman giving birth to an Rh positive baby, she is administered a shot of Rh antibodies, this introduction of the antibodies into the mother’s system will prevent her body from mounting an attack against any subsequent Rh positive fetuses . An additional layer to the blood donor-recipient relationship is HLA, Human Leukocyte Antigens, typing. Although these antigens are named for leukocytes, they are found on most cells’ surfaces including platelets. According to the Seattle Cancer Care Alliance website there are more than 2,500 different HLA molecules. In terms of blood donation and transplantation, a ‘match’ is typically defined as having 6 critical HLAs matching between the donor and recipient. These critical antigens are the A type, B type, C type and the DRB1 type, additionally some transplantation centers look at the DQ HLA as well. Transplant centers require between 6 and 7 of these 8 or 9 HLAs to be the same in the donor and recipient. HLA typing is critical for bone marrow and stem cell transplants as well as blood transfusions. In addition to immune compromised patients, patients who have been pregnant, received prior blood transfusions, or have had organ transplants in the past are more likely to have HLA antibodies in their system at the time of testing. While other people may not have any HLA antibodies. The test is done prior to transfusions to determine if there are any of these critical HLAs present and if so which ones. This testing establishes if the patient needs to receive matched or unmatched donations in regards to HLA-typing. An overview of Platelet donation- who can donate, how it works, who benefits from it, and a comparison to whole blood donation.